Situated in the southwest of the island, the Black River Gorges National Park is a popular spot for picnics, hiking and scenic drives. The park encompasses thick pine forests, gorges and rugged mountains and is a sanctuary for local flora and fauna. In fact, the park protects much of the island's remaining rainforest and some of Mauritius's endemic species, including the Mauritian flying fox. Bird-watchers will love the park and should look out for the Mauritius kestrel, the green echo parakeet and the Mauritius cuckoo shrike. 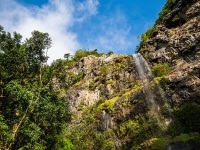 The park's Chamarel Waterfalls are the highest in Mauritius at 83m (270ft) and are best seen after heavy rains. The best viewpoints are at the Alexandria Falls or the Black River Gorges viewpoint. Cars cannot enter much of the park, which has been designed primarily for walkers, with 37 miles (60km) of hiking trails. Cars can be safely left in the car park though. Trails vary in length and difficulty and there are two visitor centres where tourists can get maps and advice. There are usually souvenir and snack stands at the popular viewing points, but the best way to enjoy the park is to come prepared with a packed picnic and enjoy one of the lovely picnic spots.